The UN Secretary-General’s request for the UN Security Council to provide additional human and material resources to the UN Mission in South Sudan (UNMISS) reflects the urgent need to protect civilians at risk amid the escalating violence, Amnesty International said. On Monday evening UN Secretary-General Ban Ki-moon called for an additional 5,500 peacekeepers to join the 7,000 UNMISS troops already on the ground with a mandate to protect civilians. “The Secretary-General’s proposal shows that the UN is acutely aware of how dire and dangerous the situation is in South Sudan,” said Sarah Jackson, Amnesty International’s Deputy Regional Director. The move to expand the peacekeeping mission comes after violent clashes between rival groups of soldiers erupted in the capital Juba on 15 December before spreading to other parts of the country. Since then, the violence – which includes inter-ethnic clashes between Nuer and Dinka communities – has resulted in hundreds of civilian deaths, including by rifle and artillery fire. Local hospitals report several hundreds of casualties, though the actual figure may be much higher. 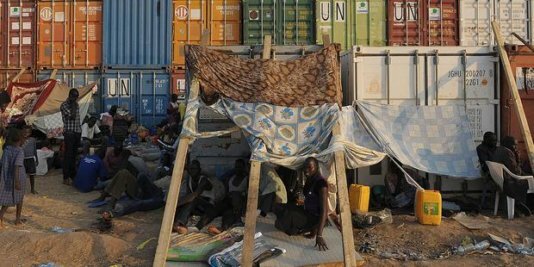 More than 80,000 have been displaced, with some 45,000 seeking shelter and protection at UNMISS bases in several cities. “South Sudanese civilians who are living in fear need to know that they can find protection and perpetrators on both sides who have been terrorizing civilians need to know that they won't be able to do so anymore,” said Sarah Jackson. In his statement on Monday, Ban Ki-moon made clear that anyone responsible for grave violations of human rights and crimes against humanity would be held personally accountable and face consequences. Amnesty International urges South Sudanese political and military leaders – in particular President Salva Kiir Mayardit, former Vice President Riek Machar and army defector General Peter Gatdet Yak – to issue clear, unambiguous orders to forces under their control and to armed civilians and militias loyal to them to immediately halt all attacks on civilians and civilian property. All available communication channels must be used to ensure that such orders and appeals are publicly disseminated as widely as possible. The organization also calls on all states to suspend international arms transfers to South Sudan as well as Sudan, where there is a likelihood of them being diverted southward across the border for use by armed opposition groups. Online petition to call on the Sudanese government to stop the atrocities in the South Kordofan province!